IF you’ve listened to any of the residents feeling hopeless by the knife murders in Camden last month, or the relatives of the victims, then you will probably understand why the CNJ has found it slightly mystifying that London Mayor Sadiq Khan has not found an hour in his diary to visit the affected communities. It’s hardly a mission to get here from City Hall and I know many in Queen’s Crescent and Kentish Town would like to hear from him. While I’ve written about the painful repetition of these unnecessary deaths, you can feel a depth and determination from within the community this time to respond as powerfully as it can. The silent march planned for Thursday, organised by volunteers, parents and teachers, has the potential to be a powerful display of unity if we all support it. It’s also an opportunity, then, for Mr Khan to come to Camden at last. As worthwhile as his deputy Sophie Linden’s communications may have been, it is Mr Khan who is instantly recognisable as the city’s leader, even to those with only a passing interest in the news. That’s the nature of the mayoralty, and his words and a public show of interest could go a long way. People who have spoken to the CNJ and at public meetings want to know these deaths will at least be a pivot for change, not a forgotten statistic. It may sound cliched or provocative but you may wonder if it’s true: would Mr Khan, or anybody else in a powerful political office, have stayed away for so long if these were two middle class white lads stabbed to death by a team of killers in a van, apparently on a marauding search for victims through our streets. This is not to imply Mr Khan himself reacts differently based on race or background – of course he doesn’t – more so our world as a whole. Would there have been more national press, more fury, more fear and in the media meltdown and parliamentary debate, would Mr Khan and maybe even the Home Secretary have had little choice but to come? Labour councillors have now communicated the interest in Mr Khan’s possible attendance on Thursday. Given how often they ask Conservative counterparts in the chamber to use their apparent party influence with colleagues in high office, who else has a better chance of getting him there. Let’s hope he can make it. I HAD to check my pulse to make sure I was not dead, joked Frank Dobson when he opened the council block named after him on the Bourne Estate last week. While he was obviously touched by the thought, the former Holborn and St Pancras MP had a point about these sort of honours normally being reserved for another time. He wasn’t going to let an opportunity to make a speech (and write some articles) about London’s housing crisis, however, and out came one of his familiar deliveries in which he explains how the property market in central London had first outpriced the nurses at the UCLH and Great Ormond Street, then the consultants, then the surgeons and so on; a sort of ‘first they came…’ riff which ends with nobody being able to afford to live near their place of work. Mr Dobson, who has himself moved out of the area since retiring from the House of Commons, could perhaps have made a similar point by looking at the building which bears his name. 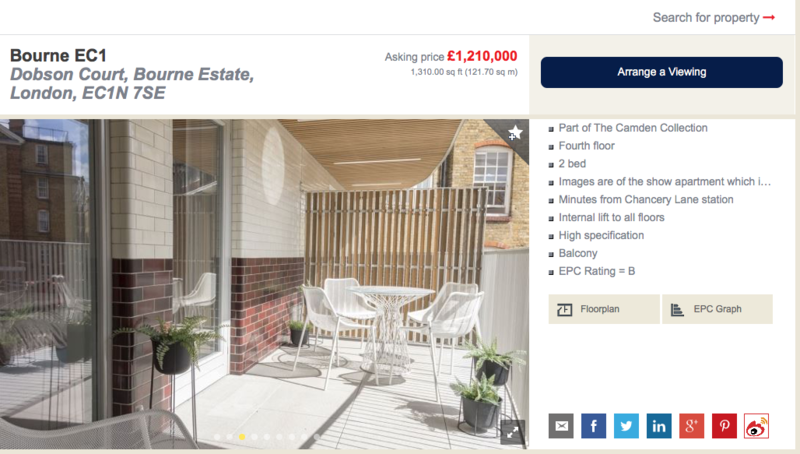 The money to pay for the very welcome new council homes at Dobson Court, after all, had to be paid for by some means and the private homes which have also been created on the site are being marketed at more than £1 million for a two-bedroom flat. Slightly out of reach of most NHS staff. LABOUR cabinet councillor Abdul Hai had his run-ins with Jonny Walker, the busker who led the campaign against a licensing system for street performers. In the council chamber, outside the council chamber, in the street, everywhere. Either foolish or brave, Cllr Hai decided to conduct a BBC interview explaining the council’s policy yards away from Mr Walker’s kazoo demonstrators back in 2014. Inevitably, Mark Thomas, the campaigning comic who had joined the protest, came over and pounced on him, with Mr Walker by his side. It was an uncomfortable afternoon for the Labour councillor, standing in the middle of Camden Town, a heartbeat of live music, defending the restrictions. CAMDEN must have the most journalists per square mile in the country, which means issues here can get maximum views. Janine Gibson, formerly of the Guardian and now the editor-in-chief of Buzzfeed UK, tweets: “Cold War or no Cold War I am THIS CLOSE to becoming a single issue voter on the question of bin collection in Camden.” It’s a swift 45 likes for that one. While Lord Ashcroft’s recent polling led to his view that the issue of bin collections (and low council tax) can no longer swing the local elections, the Camden Tories think otherwise and are persevering with it as their main-stage point of attack: Bin collections are mentioned TWELVE times in their Camden manifesto published this week. 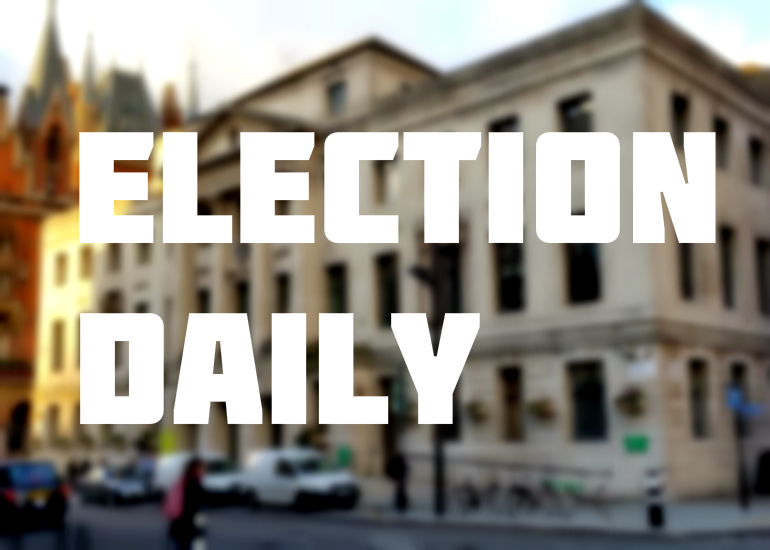 They’ve also set up a motion set up for Monday’s full council meeting which, if discussed, would see councillors across the chamber asked to vote on the record to keep – or reverse – reduced weekly collections. As it is, expect the Conservatives to remind Labour just a few more times until now and May 3 that the ruling party suggested in their last council elections manifesto, in 2014, that they would not cut back on refuse pick-ups. WHO is the most enthusiastic Conservative candidate on the subject of bins and refuse? Easy one that, Henry Newman, the ‘King of the Belfies’ (Bin selfies), who is standing in Frognal and Fitzjohn’s after a bit of a poultry run from his previous candidacy in the Labour/Green-held ward of Highgate ward. We’ve often reported on his striking love of a belfie; for his Twitter feed is decorated with scores of pictures of himself next to an overflowing bin. “The Camden New Journal dubbed me their Chief Investigative Photographer”, he now claims proudly in the Conservative manifesto this week. No, no. We dubbed you the King of the Belfies, and that word ‘their’ is an obvious no-no. Where does this cheeky spin come from? A blog lightly teasing the Tories on how their great hope (possibly a future group leader) had briefly left the local election contest for a bigger game: his unsuccessful run for parliament, miles away in North Tyneside. While he was up north the stream of belfies in north London came to a standstill. Six weeks until polling day in Camden, his attention is back with us now. THE picture time machine stops in 2006 today, and the night Labour lost control of Camden. 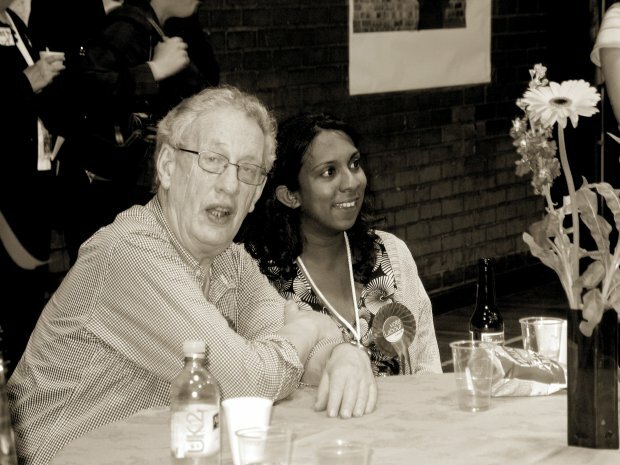 Phil Turner, a former council leader, looks a little shell-shocked, while the outgoing cabinet councillor Geethika Jayatilaka puts a brave face on the party’s tumble. 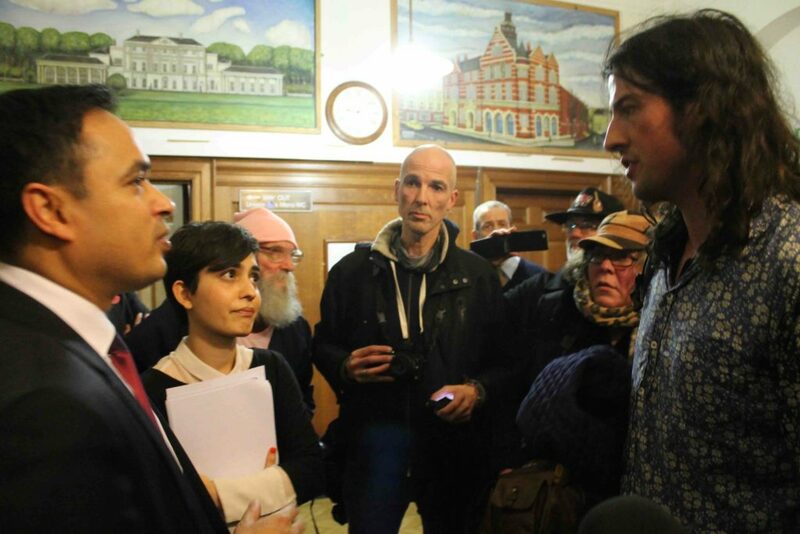 Fast forward a decade and a bit and Mr Turner almost became a candidate again in Fortune Green, despite always insisting that he does not want to return as a councillor, and Ms Jayatilaka was recently appointed the chief executive of the Chance UK charity. An admired talent, let’s float the idea that maybe one day she will come back and be a councillor again one day. Note bottle of beer on the table, the days when you could have some spikier refreshment an election counts. Also out of reach of ordinary London families on decent salaries let alone the thousands who are being paid extremely low wages in Camden. But not wealthy international property developers and investors. This kind of housing development has been happening for many years with the tacit compliance of our political representatives and with the resultant tragic effect on the culture of London. “tacit compliance of our political representatives” ABSOLUTELY !!! THE WORKING CLASS CAN KISS MY A**E WOULD SEEM TO BE THEIR PHILOSOPHY!! I don’t know why you don’t put your name to this. You use this language frequently and it’s obvious who you are. This ex lawyer shamed by his representing rogue employers against Trade Unionists is unlikely to demonstrate genuine sympathy with the working classes is he ??? cometh the hour cometh the man or otherwise ! Aimed at Russian and Far Eastern investors – with the tacit compliance of our political representatives. Rupert try addressing the QUISLINGS activities which has destroyed Labours credibility within CAMDEN entirely !! Particularly on HOUSING as Alan points out concisely !! Neil, put your name to your comments.